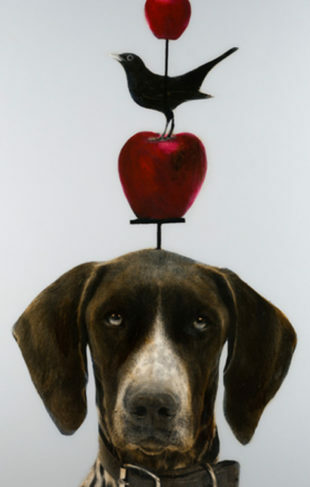 Donald Sultan is one of the leading American contemporary still life artists. Born in North Carolina, Donald Sultan received his BFA from the University of North Carolina, Chapel Hill and his MFA from the School of the Art Institute in Chicago. He moved to New York in 1975. His work is voluminous and varied. Since his first one-man show in 1977, he has enjoyed a distinguished career as painter, printmaker, and sculptor. His extensive body of work has placed him at the forefront of contemporary art, where he has become best known for his ability to successfully merge the best of yesterday's artistic tradition with a fresh, modern approach that is unique. Although his paintings fit into the criteria of a still life, Sultan describes his paintings as abstract. Sultan's large compositions of huge pieces of fruit, flowers, dominoes and other objects, set against the stark, unsettling tar-black, eight-foot square background, dominate the viewer. He is best known for his lemons, flowers and fruit, and states that his subjects develop from previous work. Sultan's work incorporates basic geometric and organic forms with a formal purity that is both subtle and monumental. His forms make powerful statements. His images are weighty, with equal emphasis on both negative and positive space. Sultan describes his work as "heavy structure, holding fragile meaning" with the ability to "turn you off and turn you on at the same time." Sultan's still life paintings have been described as studies in contrast. His powerfully sensual, fleshy object representations are rendered through a labor-intensive and unique method. Sultan has been given numerous solo exhibitions and has participated in a number of group shows. Sultan has received two honorary doctorate degrees from The Corcoran School of Art in Washington D.C. and the New York Academy of Art. His work is included in the permanent collection of many prestigious institutions including: The Museum of Modern Art in New York, Solomon R. Guggenheim Museum in New York, Tate Gallery in London, Hirshhorn Museum and Sculpture Garden in Washington, D.C., Whitney Museum of American Art in New York, and the Metropolitan Museum of Art in New York.